Edition 11 of the Walks Around Britain podcast features a walk over the iconic Kinder Scout with blogger Dean Read, "Mr Peak District" writer Roly Smith tells us about his latest book - an anthology about the Peak, we hear about a competition to find the best dog walk along the South West Coast Path, and former Gladiator Diane Youdale explains her passion for walking. 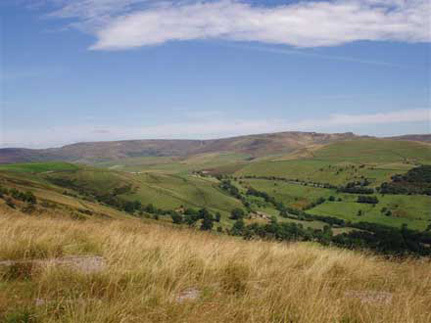 In this year of the 80th anniversary of the Mass Trespass on Kinder Scout, audio blogger Dean Read retraces the steps of those pioneering walkers who fought for access for us all. Over one of the classic routes through possibly the most challenging terrain in the Peak District, Dean enlightens us with his description of the route; making it come alive. If you'd like to listen to more of Dean's podcasts, visit his website at Peak Routes. "Mr Peak District", as Roly has been dubbed by his local newspaper, is a prolific freelance writer, editor and consultant - and the author of over 60 books on walking and the countryside. His is also the president of the Outdoor Writers’ and Photographers’ Guild. His latest book is an anthology of writings about Britain's first - and possible busiest - National Park - the Peak District. You can order "A Peak District Anthology: A Literary Companion to Britain's First National Park" from Amazon here.